are they really worried about it? Is it all they can focus on? 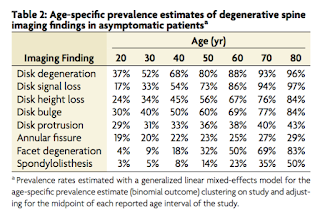 Brinjikji, W., Luetmer, P. H., Comstock, B., Bresnahan, B. W., Chen, L. E., Deyo, R. A., ... & Wald, J. T. (2015). 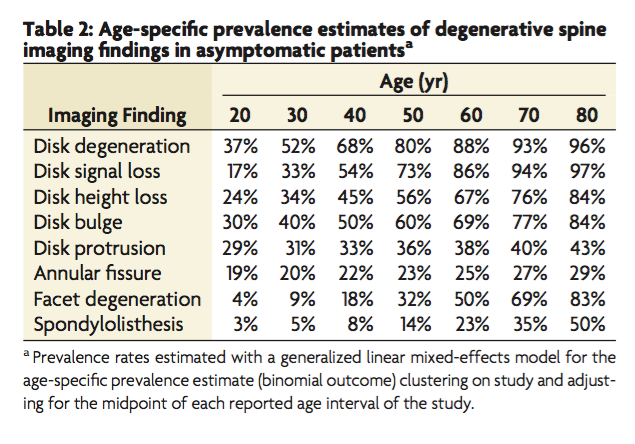 Systematic literature review of imaging features of spinal degeneration in asymptomatic populations. American Journal of Neuroradiology, 36(4), 811-816. Nakashima, H., Yukawa, Y., Suda, K., Yamagata, M., Ueta, T., & Kato, F. (2015). Abnormal findings on magnetic resonance images of the cervical spines in 1211 asymptomatic subjects. Spine, 40(6), 392-398. Post read originally found here.